Unlike the interesting history of Apple’s physical keyboards, the virtual keyboard on iOS does not have much of a tale to tell. 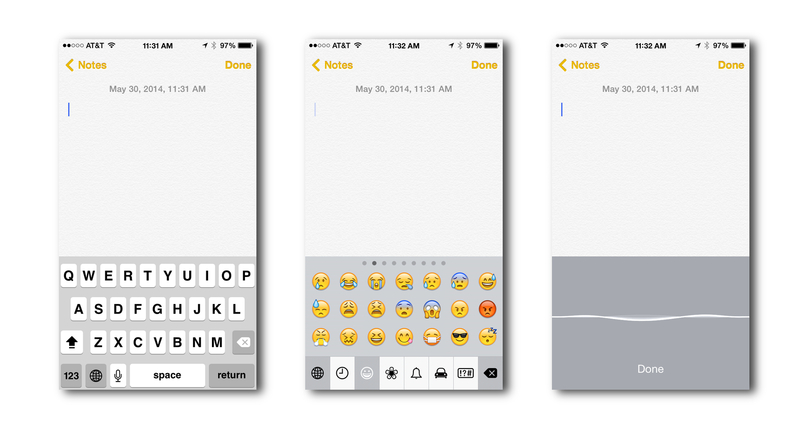 For the most part, the iOS keyboard has remained the same since iOS was first released. However, there are some ways to enhance and tweak the typing experience on iOS to make entering text on your iOS device as comfortable as possible. Caps lock and special characters – With iOS 7.1 came a somewhat confusing change to how the keyboard displays whether the caps lock is on or not. A grey button with a white arrow is off, a white button with black arrow is on, and if the black arrow with a line under it the caps are locked. What did not change is the ability to tap and hold a key on the keyboard to select alternate characters. The dollar sign, as an example, will show characters representing other currencies when held down. Many iOS users I have spoken with wish that just like pressing and holding a key brings up certain characters, toggling on the shift lock would change the case of the displayed letters to show exactly what character each key represents. Tap and hold the numeric – A lesser-known trick to help maximize your typing efficiency on the iOS keyboard is to tap and hold on the punctuation and numeric key when you enter a number. Typically, one must tap the number or punctuation, enter the number or punctuation desired, then tap the letters key to switch the keyboard back again. If instead you keep holding on the key as you enter numbers, then all you need to do is release the key to automatically switch back to the alphabet keys. This beats having to keep tapping in order to switch back and forth. Managing multiple keyboards – One of the most popular secondary keyboards that people want to install is the emoji keyboard. This particular keyboard has all of the emoticon or smiley faces people like to use while chatting. To add additional keyboards you simply go to Settings > General > Keyboard > Keyboards and select the keyboard you desire. Having multiple keyboards will add a ‘hidden’ key with a globe icon on it to your keyboard. Tapping and holding the globe will display a list of keyboards that you currently have active. Just tapping the globe will toggle through the different keyboards available. Siri dictation – Another often forgotten key on the keyboard is the one that enables Siri dictation: the microphone key. Not all devices support Siri, so don’t be too alarmed if you do not see this key on your keyboard. Tapping on the microphone will bring up Siri in listen mode. Everything you say will become text on the screen. 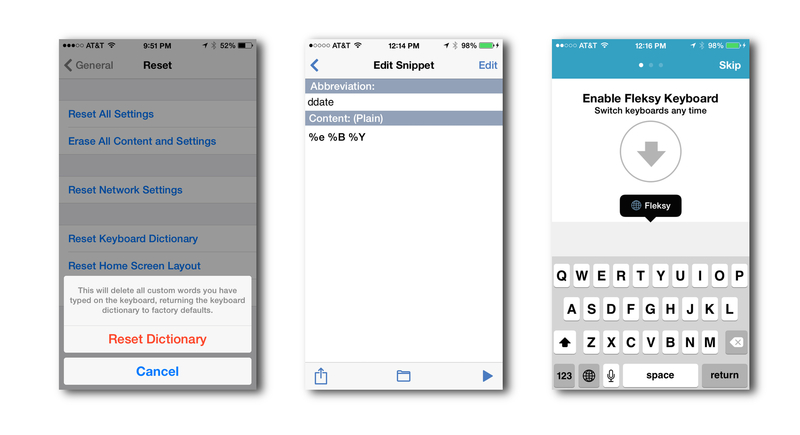 Resetting AutoCorrect – When typing, the iOS keyboard will try to correct what you are typing. It will add capitalization, auto correct your typos and even add periods to the end of your sentences. To control this behavior go to Settings > General > Keyboard and turn on or off the features you want. Sometimes your keyboard’s autocorrect can get a bit out of hand, replacing words you don’t want it to. To fix this behavior go to Settings > General > Reset where you will see an option to Reset Keyboard Dictionary. Selecting this will erase the autocorrect dictionary that your iOS device has learned from your past typing. User defined shortcuts – Another way to combat commonly misspelled words is to create a keyboard shortcut that will for instance automatically change ‘teh’ to “the”. You can even create your own text shortcuts that will give you the option to replace shortened text like ‘omw’ with an entire phrase like “On My Way!” The great thing about these shortcuts is that they are available from everywhere within iOS. TextExpander snippets – With TextExpander ($4.99 Universal) snippets you can create replacements using macros for date, time and math functions. You can also create fill-in fields, nested snippets and even control where the cursor will be after each snippet has been applied. The one downside is that these snippets are only available within the 60 apps that support TextExpander, and not everywhere within iOS like the shortcuts are. Replacing the keyboard – If you are open to trying something different, the you could give either Flesky (FreeUniversal) or SwiftKey (Free Universal) a try. Flesky is a keyboard replacement that supports gestures on the keyboard to perform simple tasks, like deleting a character. SwiftKey for iOS adds a smart bar to the top of the keyboard to make tasks like correcting text or formatting text easier. Only time will tell if other apps start using either company’s software development kit to provide an alternate keyboard experience on iOS. Developer’s choice – Beyond the language based keyboards that you can select in the general settings, you may have noticed other keyboards that pop up from time to time. Some are optimized for entering phone numbers, URLs or email addresses. There are actually eleven different keyboard types use to enter text. These keyboards, however, are determined by the developer and not the user. 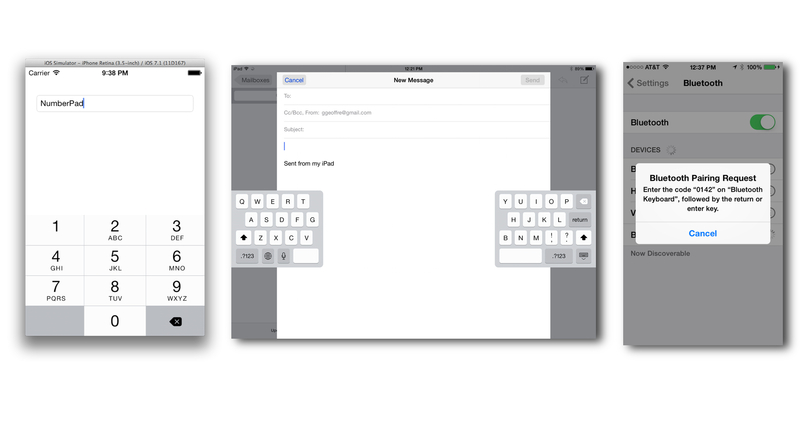 Split keyboard on iPad – On the iPad, it is possible to undock your keyboard from the bottom of the screen. To do so all you need to do is tap and hold on the keyboard icon located on the bottom right corner of the screen and select “Undock.” There is also an option to “Split” the keyboard so that half of the keyboard is on the right side of the screen, and half is on the left. Being able to move the keyboard around in the iPad can make Blackberry style ‘thumb typing’ more practical when you are holding the iPad with both hands. Bluetooth keyboards – There are actually quite a few different types of Bluetooth keyboards to consider pairing with your iOS device. A larger keyboard like the Apple Wireless Keyboard works best at a location you sit at often and perhaps have a stand for your iOS device nearby. There are cases for the iPad like the Logitech Ultra-thin Keyboard cover for the iPad Air or iPad mini that allow you to easily take your keyboard with you. One of my favorites however has been the QQ-Tect Mini Handheld Keyboard. It is great for conference rooms and lecture halls where you may be walking around or just need to quickly pass around a keyboard for a quick typing session. USB keyboards – If you happen to have a full-sized desktop keyboard that you like to type on, you may be able to connect it to your iOS device using either the 30-pin Apple iPad Camera Connection Kit or theLightning to USB Camera Adapter. Keep in mind that this will not work with all manner of USB keyboards. Especially keyboards that draw a lot of power or have additional USB devices attached like a USB Hub or a track pad. OK—I just read a post somewhere else that noted the split keyboard needs to be activated in Settings. And another post clarified just how to implement the change from numeric to alpha keyboards. But I still can’t find the dedicated numeric keyboard illustrated in this article (just before the split keyboard illustration) Any advice? It’d be great is iOS has more that uppercase and locked uppercase. Smart title case would be great. I guess that is progress.